ELMAU — His website left the program as vague as “Beethoven and Shostakovich” right up until the recital, but Igor Levit knew exactly what he wanted to do Aug. 14 in the timber-framed auditorium of this isolated castle-spa below the Wettersteinwand. An aural onslaught was in the offing. The pianist would deny the Waldstein Sonata (1803) all stylistic context and push every limit in nine prelude-fugue pairs from the Russian composer’s Opus 87 (1951), written for Nikolayeva. Beethoven’s Allegro con brio emerged frenzied, indeed cacophonous. His slow movement sprawled unworkably. The Rondo’s opening melody had poise, but much passagework was rushed or inarticulate — this from an artist promoted by Sony Classical for his grasp of Beethoven’s universe. Then came the preludes and fugues (Nos. 1, 4, 9, 10, 11, 14, 15, 18 and 24), and somehow they stood up, proving craggy and caustic, mordant and merry. Their varying structures and challenges palpably engaged Levit, even if he did use the scores. He telegraphed affection in No. 1 (C Major), brought clarity and imagination to No. 10 (C-sharp Minor), mustered a macabre, sustained tension for No. 14 (E-flat Minor). He savored contrasts throughout yet reveled in density, for instance in the heavy-handed double fugue of No. 4 (E Minor) or in the mad emphases of No. 15 (D-flat Major). Neatly delineated counterpoint was in short supply, however, as was poetry. 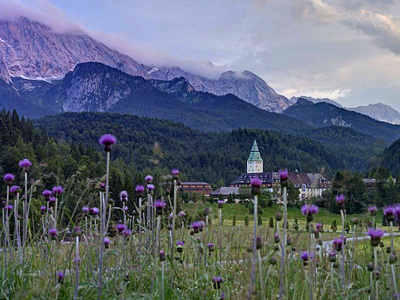 Recitals and readings have been a central pursuit at Schloss Elmau since theologian Johannes Müller established the German retreat a century ago. Performances typically end the day for overnighters drawn by the mountains, forests, sports, treatments and “five-asterisk” dining. Tickets are made available as well to residents of villages within a certain distance. The memorable open-arms image of Bundeskanzlerin Merkel and President Obama derives from a G7 Summit here. This entry was posted on Tuesday, September 19th, 2017 at 5:06 am	and is filed under Munich Times. You can follow any responses to this entry through the RSS 2.0 feed. Both comments and pings are currently closed.